Present at the NTSB news conference were: Chairman Robert Sumwalt (seated on the left), Vice Chairman Bruce Landsberg, Board Member Earl Weener and Board Member Jennifer Homendy. The National Transportation Safety Board (NTSB) released its 10 Most Wanted List—a serious action plan for implementing 46 safety recommendations in the coming two years, at a press conference in the National Press Club. 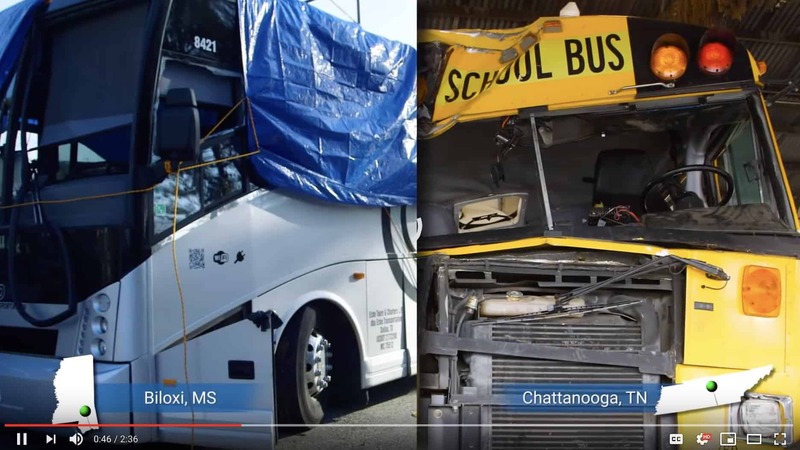 A screen capture from the NTSB’s YouTube presentation, included discussions on some notable school bus accidents. Collision avoidance systems were discussed. The NTSB presentation on Monday began with opening remarks from NTSB Chairman Robert Sumwalt, who announced the 10 Most Wanted List. 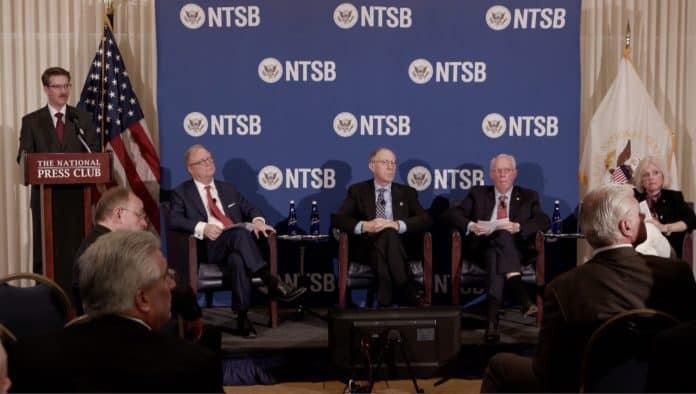 The chairman joined NTSB Vice Chairman Bruce Landsberg, and board members Earl Weener and Jennifer Homendy, for a moderated panel discussion about the issues and accidents covered by the list, and what safety recommendations were developed. A question and answer session followed the panel discussion. TO NHTSA: Require all new school buses to be equipped with collision avoidance systems and automatic emergency braking technologies. 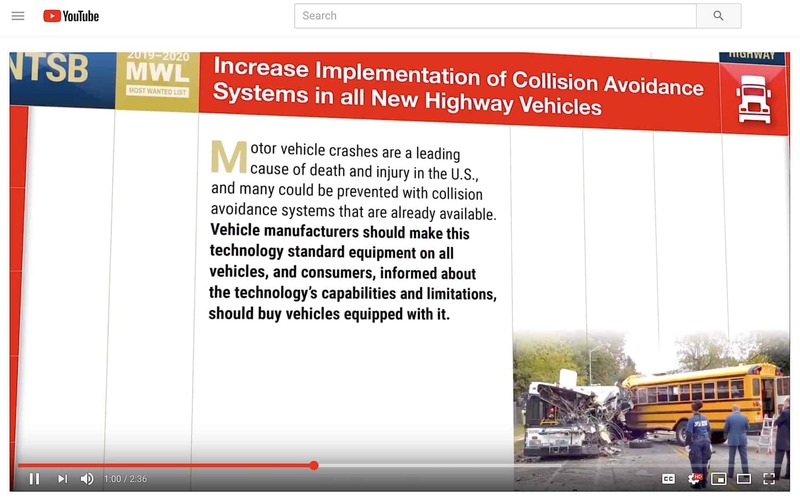 TO BLUE BIRD CORP., COLLINS INDUSTRIES, INC., IC BUS, STARCRAFT BUS, THOMAS BUILT BUSES, INC., TRANS TECH & VAN–CON, INC.: Install a collision avoidance system with automatic emergency braking as standard equipment on all newly manufactured school buses. TO NHTSA: Modify Federal Motor Vehicle Safety Standard 217 to require that all emergency exits on school buses be easily opened and remain open during an emergency evacuation. TO THE STATE OF MISSOURI: Revise your bus evacuation regulations to require that pupils traveling to an activity or on a field trip in a school bus or a school-chartered bus be instructed in safe riding practices, and on the location and operation of emergency exits prior to starting the trip. TO THE STATES OF CALIFORNIA, FLORIDA, LOUISIANA, NEW JERSEY, NEW YORK & TEXAS: Develop: (1) a handout for your school districts to distribute annually to students and parents about the importance of the proper use of all types of passenger seat belts on school buses, including the potential harm of not wearing a seat belt or wearing one but not adjusting it properly; and (2) training procedures for schools to follow during the twice yearly emergency drills to show students how to wear their seat belts properly. TO THE NATIONAL ASSOCIATION OF STATE DIRECTORS OF PUPIL TRANSPORTATION SERVICES, NATIONAL ASSOCIATION FOR PUPIL TRANSPORTATION, NATIONAL SCHOOL TRANSPORTATION ASSOCIATION, SCHOOL BUS MANUFACTURERS TECHNICAL COUNCIL, AND NATIONAL SAFETY COUNCIL, SCHOOL TRANSPORTATION SECTION: Develop guidelines and include them in the next update of the National School Transportation Specifications and Procedures to assist schools in training bus drivers, students, and parents on the importance and proper use of school bus seat belts, including manual lap belts, adjustable lap and shoulder belts, and flexible seating systems. TO THE NATIONAL ASSOCIATION OF STATE DIRECTORS OF PUPIL TRANSPORTATION SERVICES, NATIONAL ASSOCIATION FOR PUPIL TRANSPORTATION, AND NATIONAL SCHOOL TRANSPORTATION ASSOCIATION: Provide your members with educational materials on lap and shoulder belts providing the highest level of protection for school bus passengers, and advise states or school districts to consider this added safety benefit when purchasing seat belt-equipped school buses. TO THE SCHOOL BUS MANUFACTURERS TECHNICAL COUNCIL: Develop a recommended practice for establishing and safeguarding the structural integrity of the entire school bus seating and restraint system, including the seat pan attachment to the seat frame, in severe crashes—in particular, those involving lateral impacts with vehicles of large mass. TO THE STATES OF FLORIDA, LOUISIANA, NEW JERSEY & NEW YORK: Amend your statutes to upgrade the seat belt requirement from lap belts to lap/shoulder belts for all passenger seating positions in new large school buses in accordance with Federal Motor Vehicle Safety Standard 222. TO THE STATES OF ALABAMA, ALASKA, ARIZONA, COLORADO, CONNECTICUT, DELAWARE, GEORGIA, HAWAII, IDAHO, ILLINOIS, INDIANA, IOWA, KANSAS, MAINE, MARYLAND, MICHIGAN, MINNESOTA, MISSISSIPPI, MISSOURI, MONTANA, NEBRASKA, NEW HAMPSHIRE, NEW MEXICO, NORTH CAROLINA, NORTH DAKOTA, OHIO, OKLAHOMA, OREGON, RHODE ISLAND, SOUTH CAROLINA, SOUTH DAKOTA, TENNESSEE, UTAH, VERMONT, WASHINGTON, WEST VIRGINIA, WISCONSIN, AND WYOMING; THE COMMONWEALTHS OF KENTUCKY, MASSACHUSETTS, PENNSYLVANIA, AND VIRGINIA; THE DISTRICT OF COLUMBIA; AND THE TERRITORY OF PUERTO RICO: Enact legislation to require that all new large school buses be equipped with passenger lap/shoulder belts for all passenger seating positions in accordance with Federal Motor Vehicle Safety Standard 222.